IK Multimedia has announced its deal for the holidays; up to 50% off all software and apps. 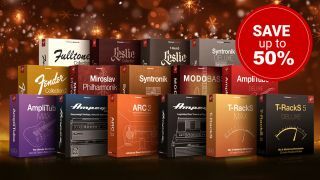 You can save on the likes of Syntronik Deluxe, with its vast collection of sampled classic synths, or the Leslie Collection, if you want to take those guitar tracks for a spin with some iconic rotary speaker action. It’s not all about desktop users though as mobile users are more than catered for with the All-In 2018 bundle inside AmpliTube, which will unlock all the new gear IK has released. In fact it’s not just AmpliTube either, with all in-app purchases 50% off. This deal ends 31 December 2018 and you can find out more on the IK Multimedia website.